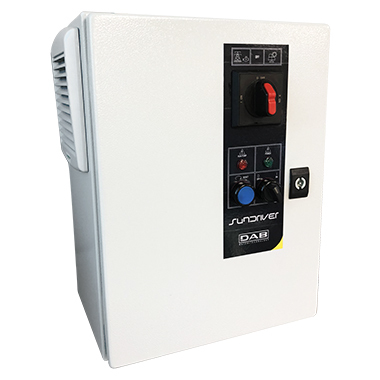 Electronic protection and control panels with inverter for “off-grid” photovoltaic systems for use in several types of pumping systems, from collection from the subsoil, to circulation, swimming pool filtering, transfer and accumulation of water. SUNDRIVER is designed to be powered mainly by solar energy. However, in case of need, powering from the electricity network or from a generator is also possible, using a manual selector switch, therefore also ensuring operation when solar energy is not available.